Budds' Chev | Blog | What Does ‘Denali’ mean on a GMC Vehicle? What Does ‘Denali’ mean on a GMC Vehicle? GMC trucks are hard to overlook. Bolder and more muscular than any other brand, they just seem to ooze presence. And none have more swagger than those carrying the “Denali” badge. So today at Budds’ we’re going to explain the significance of the “Denali” badge. We’ll start however with a little detour to Alaska. Until 1867 Alaska was part of Russia. That year, perhaps not coincidentally the same year Canada gained independence, Russia sold it to the US. The US then pretty much forgot about it—until a gold prospector noted that it had a really big mountain. In the usual Anglo-Saxon manner of that era, the mountain was promptly named Mount McKinley, in honor of Presidential candidate William McKinley. This seems an appropriate moniker for a mountain 6,190m high. But a vehicle? Slapping a badge that reads, “The Great One” on a truck seems a pretty bold statement. Here’s why it’s warranted. GMC sells four different pickups: the Canyon and the Sierra 1500, 2500, and 3500, each of which is available in Denali trim. In addition, there are four crossovers/SUV’s: the Terrain, Acadia, Yukon and Yukon XL and again, there’s a Denali version of each one. GMC likes to say their vehicles are “Professional Grade.” That’s shorthand for built to a higher standard. They’re not just stronger and better-equipped, but incorporate higher quality materials to withstand intensive use. GMC trucks are workhorses, but that doesn’t mean they’re utilitarian. Take the Canyon mid-size pickup. 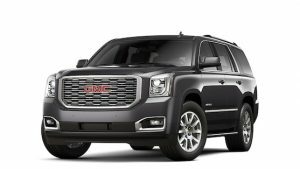 The least expensive GMC vehicle, this gets a power driver’s seat, a 2.5-liter engine with a six-speed transmission and will haul up to 2,500kg. SLE trim adds touches like an 8” infotainment screen, chrome door handles and cruise control. The SLT gets more goodies still, like a V6 and heated seats, but Denali really goes all-in. At this level, only available in 4WD with the crew cab and either a short or long box, buyers get a host of luxuries. For example, there’s a two-speed automatic transfer case, an included trailering package, Bose audio and ventilated, leather-upholstered front seats. In other words, it’s a luxurious ride that will also carry a 2,700kg payload. Now let’s turn to the top of the GMC line, the Yukon XL and XL Denali. First off, this big SUV has a traditional body-on-frame construction that makes it a real workhorse. Second, it’s really big. How big? Well, it’s 5.7m long, 2.0m wide and 1.9m tall. Inside you’ve got three rows of seats and cargo volume of 1,112, 2,172 or 3,446 liters, depending on whether you fold down none, the third row or the second and third row of seats. Is that big enough? In SLE and SLT trims you get a 5.3 liter V8 while the cabin is full of really desirable features. These include a nine-speaker Bose sound system, premium cloth seats, (with leather in SLT trim,) and a leather-wrapped steering wheel. But if you think that sounds good, well it’s Denali time. This packs a 6.2 liter V8 paired with a 10-speed transmission. A two-speed active transfer case allows shifting on-the-fly between 2WD and 4WD. Properly equipped, it’ll tow 2,700kg. Inside you’ve got active noise cancellation that keeps the cabin nicely hushed. (It won’t shut out the “Are we there yet?” cries though, so you may want to invest in the available rear seat entertainment system.) Seats are leather and both heated and cooled. (Jet black perforated leather is a highly attractive option.) There’s also power folding rear seats and an even better Bose audio system. If you’re taking the family up to the cottage, this is the vehicle to do it in. 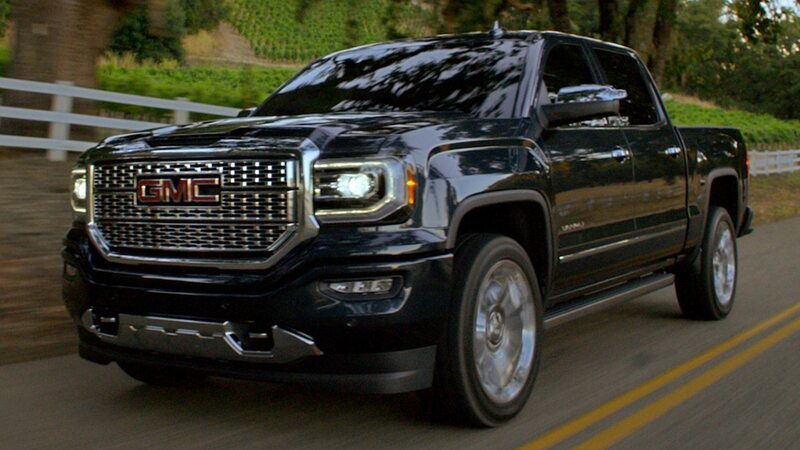 “Denali” means, “The Great One” in the Koyukon Athabascan language, and GMC save it for their very best vehicles. GMC trucks are all “Professional Grade,” but Denali elevates that significantly. However, you don’t have to take our word for it. Come see us at Budds’ and drive one of the “great ones” for yourself.